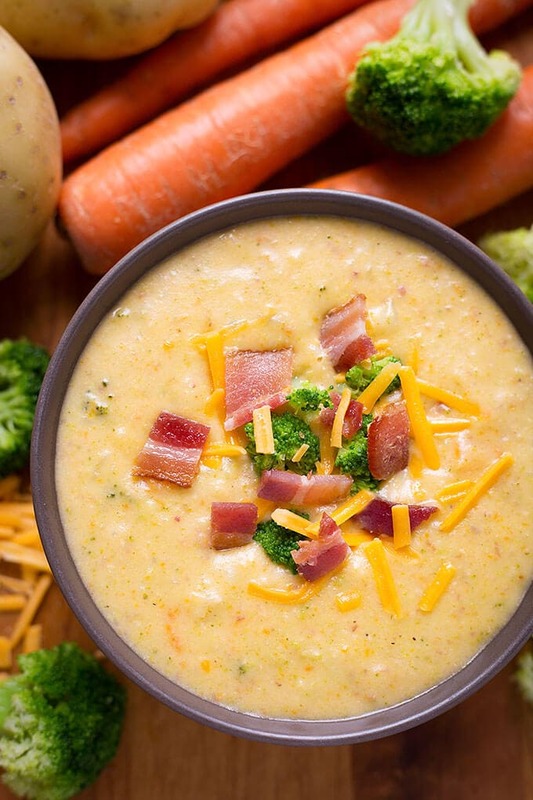 Loaded Broccoli Cheese & Potato Soup will get the family around the dinner table! 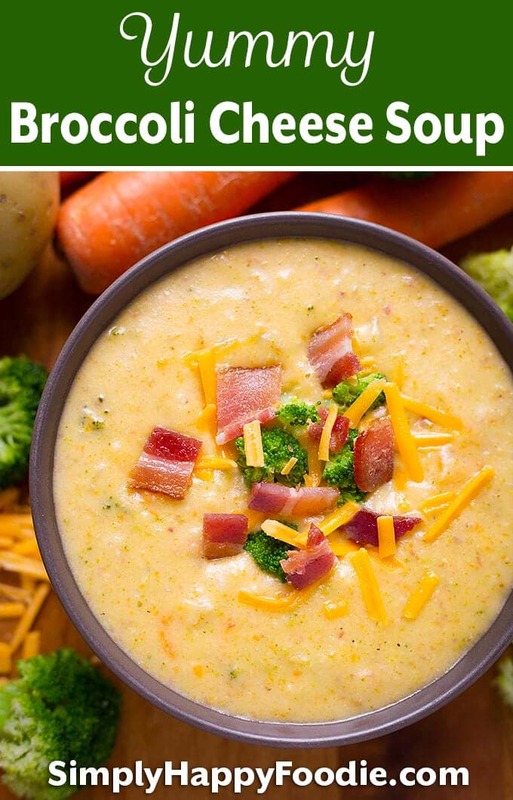 A delicious broccoli cheese soup that is ready in under an hour. This morning I felt the slightest nip of Fall in the air! Maybe it was wishful thinking, but it really did feel cooler. As much as I love Summer, I’m ready for Fall and all of the beauty and comfort that comes with it! I was born in the Fall. I’m an October baby. Fall is such a transitional time of year. Not just the weather, but the kids going back to school, and the promise of change is never more prominent than when you walk out on a crisp Autumn morning and see your breath, and feel the nip in the air. If you are lucky enough to live somewhere that has Fall colors in the foliage, that’s a great bonus! We have trees galore up here in Washington. Though we are the Evergreen State, we have our share of deciduous trees, especially Maples. They turn the most amazing colors in the Fall. Though we sure don’t beat New England for Fall color, it’s really nice! By the way, I dream of visiting New England in the Fall. Sigh, one day! On the list! It’s time to start getting more comfort food recipes up on the blog for you. I needed to share this Loaded Broccoli Cheese & Potato Soup with you. It is total comfort food, and delicious! Kids love it. Husbands love it. Wives, friends, girlfriends, and boyfriends love it! You get the picture. Get your favorite boots ready, and air out your sweaters. Then make this soup as soon as you want a great tasting and comforting Fall, or Pre-Fall meal! 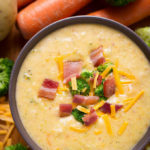 Loaded Broccoli Cheese & Potato Soup tastes rich and delicious. 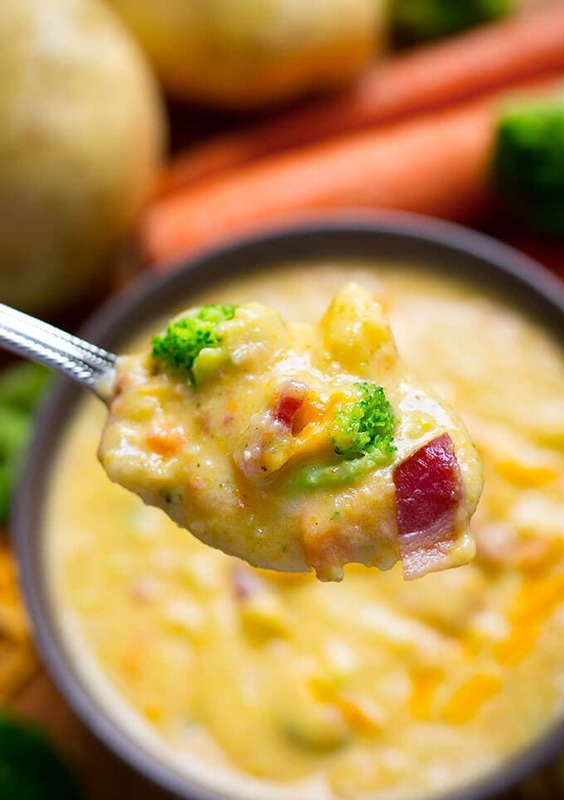 Total comfort food loaded with cheese, potatoes, broccoli and bacon! Melt butter in a large pot 5 to 7 quart size). Add Onion, carrots, celery and sauté until softened. Sprinkle the flour over the vegetable mixture and increase heat a little, stirring until a paste forms. Gradually whisk in the broth, making sure no lumps have formed. Add the potatoes and cook for about 10 minutes, until they just start to soften. Add the broccoli, salt, & pepper. Stir and let cook another 5 minutes, stirring occasionally. Add the milk, and let heat through. If you like a chunky soup, at this point you can just stir in the bacon and cheese and serve. Remove 4 cups of the soup to a bowl and set aside. Use an immersion blender to puree the soup in the pot. Then add back the 4 cups you took out. Stir in the bacon and cheese and let cheese melt. If you like a creamier consistency, Use an immersion blender to puree the soup right in the pot (If you opt to use a blender or food processor, please be extremely careful and follow manufacturers guidelines for pureeing hot foods). Reserve 1/2 cup of the cheese, and 1 slice of the chopped bacon for garnish. You could also top with some sour cream.